Find this beer and more at Full Throttle Bottles in Georgetown. Visit during Full Throttle’s 21st Amendment tasting tonight to try this and three of their other beers. 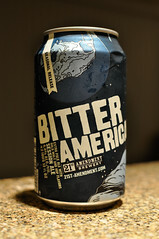 Intro: 21st Amendment Brewery, located in San Francisco, CA, continues to release interesting beers in 12oz cans. Bitter American was released last month, and their Monk’s Blood Belgian-style Dark Ale is due out later this month. They join Brew Free or Die IPA, Fireside Chat, and Back in Black to make a lineup of cans that is far from typical. Low alcohol beers with taste can be hard to come by, so this is a welcome addition. At just a slightly higher alcohol by volume than your average “light beer” from the macro brewers, this beer is welcome in my fridge anytime. Description: Pours a light amber with medium head that sticks around. A beautiful citrus hop aroma jumps out of the glass. The taste is a big punch of dry tropical and citrus hops that dominate throughout. The malt backbone is very basic and just does enough to balance; a bit of breadiness comes through. It finishes a little soapy and with a moderate bitterness. High carbonation helps it stay nice and crisp throughout. Overall, this packs in a lot of hop character for a such a low ABV beer, and I wouldn’t hesitate to put down a few of these. It isn’t complex by any means, nor is it meant to be. Click here to see a list of select local bottle shops. If you’d been rocketed into space against your will, you might be a little bitter too. Bitter American is our long-overdue tribute to unsung, unwitting heroes everywhere. This American session ale packs a lot of hop and malt flavor into a refreshingly lower-alcohol brew, making it the perfect beer to have on hand when you have a little history to make. Bitter American is our late winter seasonal beer available from January through March in six pack cans and on draft. This extra pale session ale has lower alcohol but all the flavor and hop aroma you expect from a much bigger beer. Give one, or three, a try. In the interest of full disclosure to satisfy the FTC’s law, this review was of a sample bottle received from the brewery.